an accomplished composer, accordionist, and experimental music pioneer, has died. We are deeply affected and very sad. Our thoughts are with her family and all those who were close to her. 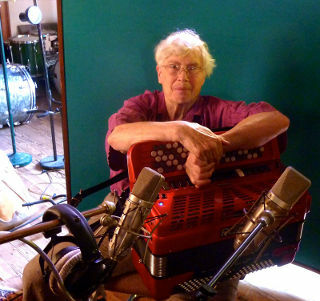 Pauline Oliveros was a senior figure in contemporary American music. Her career spans fifty years of boundary dissolving music making. In the 1950s she was part of a circle of iconoclastic composers, artists, poets gathered together in San Francisco. Oliveros has been as interested in finding new sounds as in finding new uses for old ones—her primary instrument is the accordion, an unexpected visitor perhaps to musical cutting edge, but one which she approaches in much the same way that a Zen musician might approach the Japanese shakuhachi. Since the 1960’s she has influenced American music profoundly through her work with improvisation, meditation, electronic music, myth and ritual. Pauline Oliveros was the founder of „Deep Listening,“ which she describes as a way of listening in every possible way to everything possible to hear no matter what you are doing. Such intense listening includes the sounds of daily life, of nature, of one’s own thoughts as well as musical sounds. Deep Listening is my life practice,“ she explains, simply. Oliveros was given the John Cage award for 2012 from the Foundation of Contemporary Arts. She was Distinguished Research Professor of Music at Rensselaer Polytechnic Institute, and Darius Milhaud Artist-in-Residence at Mills College.